Celebrate the birthday of the Animal Cracker 'Happy birthday to you, Happy birthday to you...." And boy do we have a lesson in food history for you today. If my calculations are correct, Animal Crackers turn 111 years old today, and they taste good for their age. Animal crackers are usually an animal one might see at a zoo or circus, such as a lion, tiger, bear, or elephant. The most common variety is light-colored and slightly sweet, but darker chocolate-flavored and colorful frosted varieties are also sold. 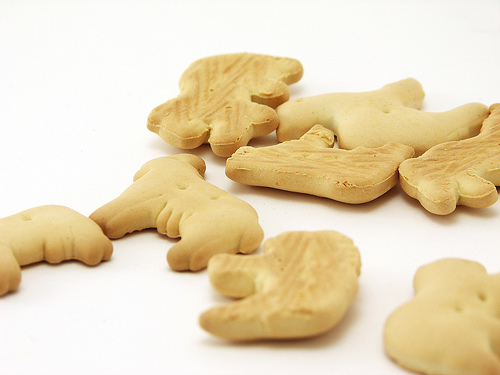 Even though animal crackers are made with a layered dough like crackers, they are sweet like cookies. In the late 19th century, animal-shaped cookies called "Animals" were imported from England to the US and they became so incredibly popular that bakers began to produce them domestically. Stauffer’s Biscuit Company produced their first batch of animal crackers sometime around the start of the 20th century in York, Pennsylvania. In 1902, animal crackers officially became known as "Barnum's Animals" and evoked the familiar circus theme of the Barnum and Bailey Circus. Later in 1902, the now-familiar box was designed for the Christmas season with the innovative idea of attaching a string to hang from the Christmas tree. 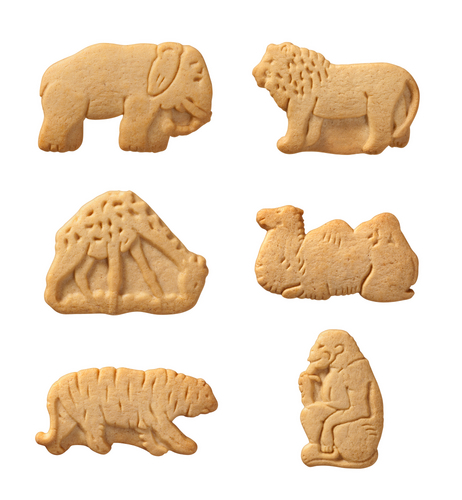 Through all of it's varieties a knock offs over the last 110 plus years, animal crackers are essentially the same today and enjoyed by children and adults alike. Another swell childhood memory passed on from generation to generation. Press crumb mixture evenly over bottom & sides of a 10-inch round pie pan. Bake crust in 425 degree oven for 10 minutes or until slightly golden around edges. Remove from oven to wire rack to cool.